So what else would I be doing on a Friday night but going to a football match! 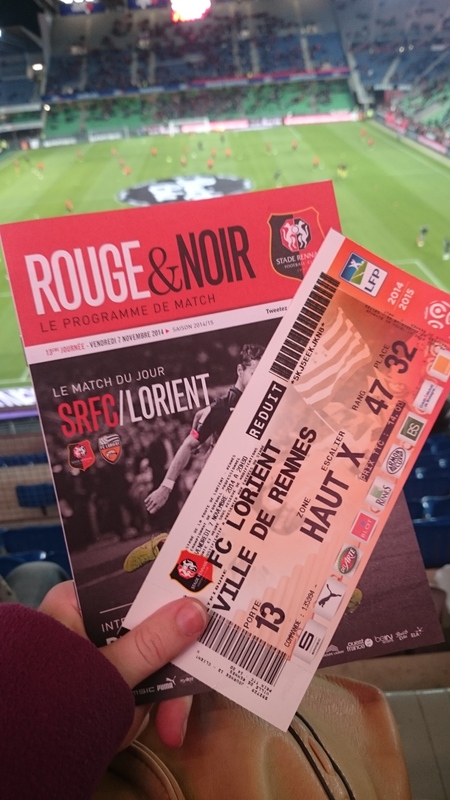 I am not an avid football fan but I don’t mind watching a game so when we found out Rennes FC were playing Lorient FC we couldn’t pass up the opportunity to see our adopted town playing. The tickets were very reasonable for students and like I said it was something to do on a Friday night. So we bundled up in our winter woollies as the temperature has dropped slightly and headed off on our football adventure. 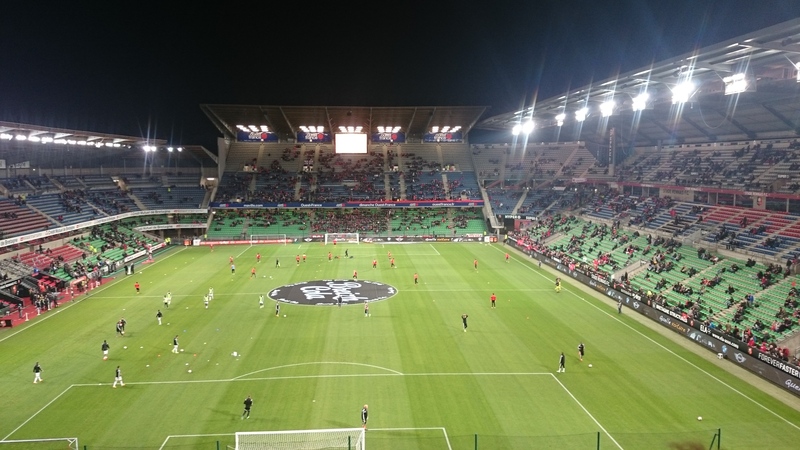 It was all very organised with buses waiting in the main centre all heading directly towards Stade Rennais for the match so it couldn’t have been easier for us. I had tried to buy tickets online that day but it wouldn’t work so the first thing we had to do when we arrived was get some tickets and then we were on our way. Our seats were quite high up in the ‘rafters’ as some might say but it gave us a prefect 360 view of the pitch and everything that was happening. I was certainly glad that I was bundled up in my hat,scarf and gloves as it was a little chilly up there but it gave us a great view. 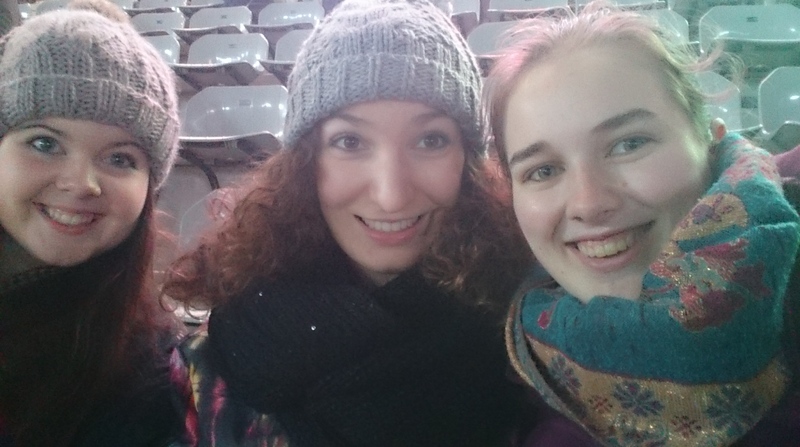 After some pre-match selfies on our part and the match formalities it was time to kick off the match. I have to say that once the game started we got very into it. 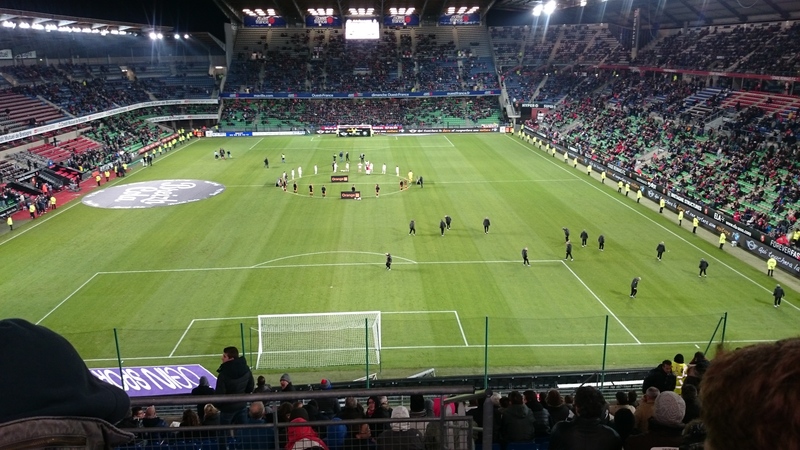 I am used to football matches having been to many of my brother’s when I was younger and I of course think I can do it better then those on the pitch , this lead to a lot of screaming and shouting as balls were lost and shots on goal were missed. It was all very tense and I’m sure if the people around us had understood us they probably would have laughed at us three girls getting so into the game. With nothing happening really for most of the game we decided to leave after 87 mins to just get out before the crowds and onto the bus home. 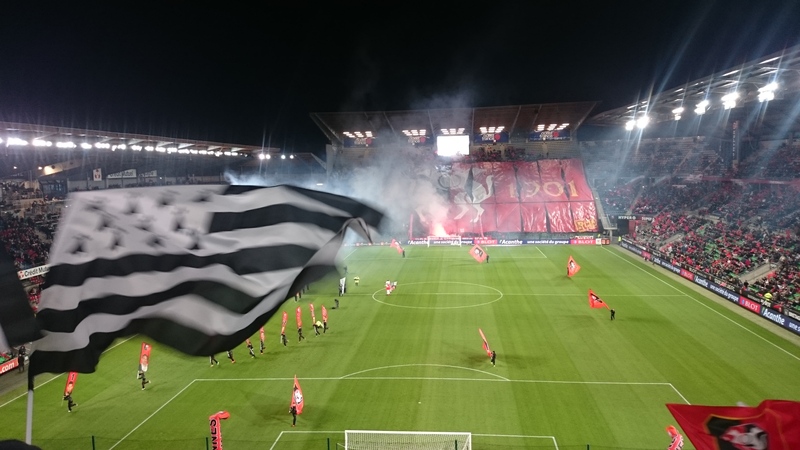 As we were walking down the stairs outside we heard an almighty roar from the crowd and what would you know Rennes had just scored in the 89th minute, well we ran up to the television screens in the halls of the stadium and got to see the replay of the goal but it was just typical that they decided to score just after we left. 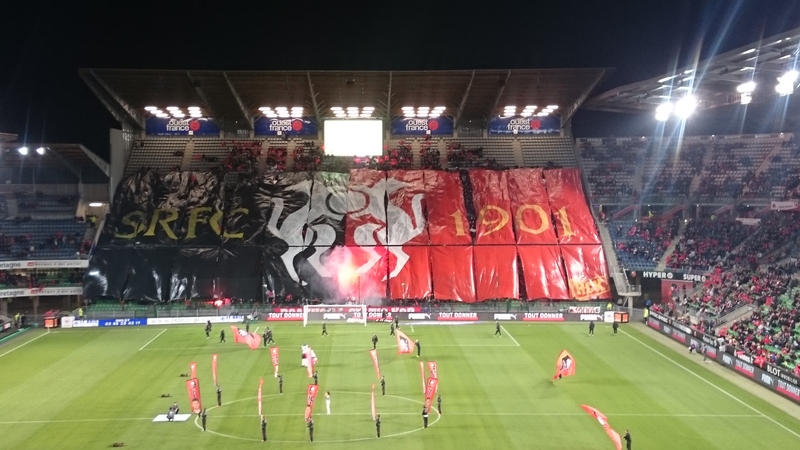 That was how the game ended with Rennes winning 1-0 . Then we were on the buses and home within a half an hour which was great. 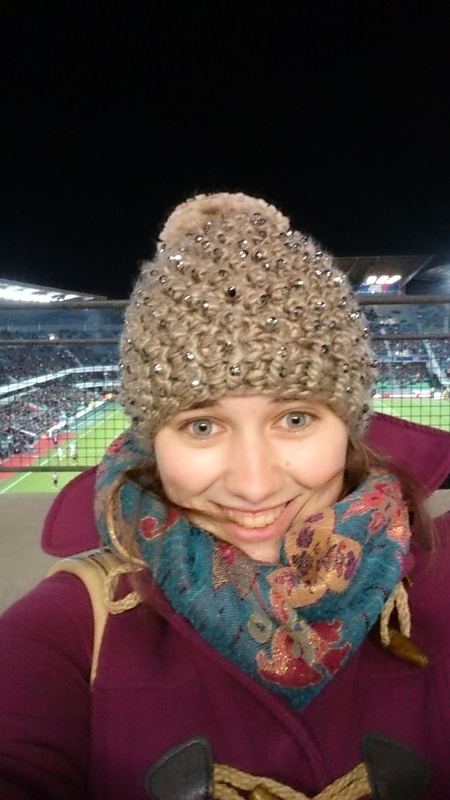 I have to say that they were so organised as when we came out there were buses waiting in a long line and there were plenty of police around so we felt very safe even though there were big crowds and you know football hooligans are all over the world. I will definitely try to head to another game before the year is out. 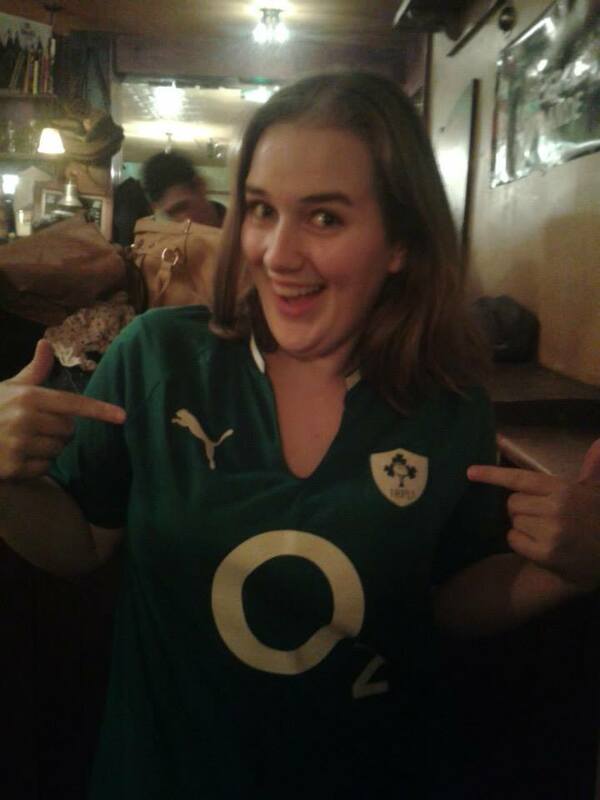 That was the start of our sporty weekend as on Saturday we headed to a local Irish Pub ‘O’Connells’ in Rennes to watch the Irish rugby match and see them beating South Africa which I have to say made me very happy. I get very into my rugby so I’m sure some people were looking at me as I was willing the team on and taking every hit and missed ball to heart. With both my adopted home for the year Rennes winning in the football and my home country Ireland winning in the rugby it was the prefect way to start the weekend. Me wearing my Irish jersey for the match.